Получены две новые QSL карточки от Radio Free Asia за рапорт от 1 сентября 2018 года. Карточка посвящена 22-й годовщине станции, 29 сентября 1996 года состоялась первая трансляция. Письмо отправлено 5 сентября из США. 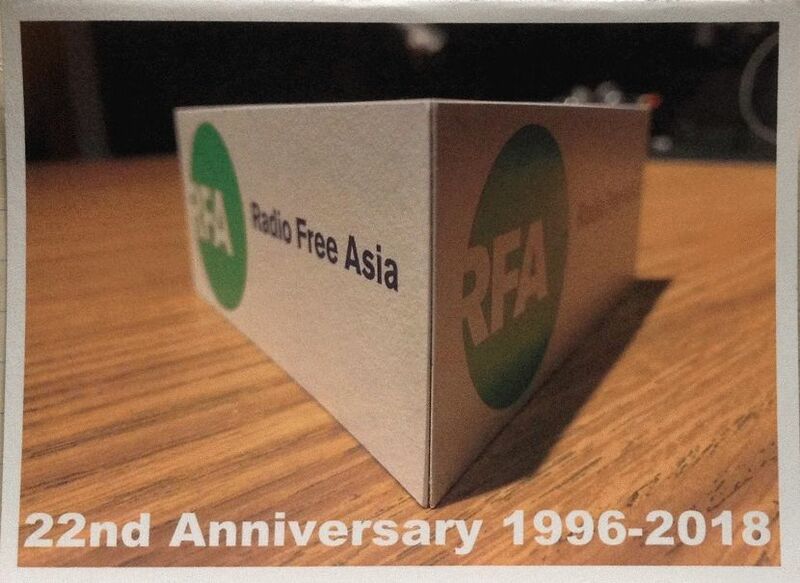 Radio Free Asia (RFA) announces its 22nd Anniversary QSL! Bringing free press to closed societies, RFA’s first broadcast was in Mandarin on September 29, 1996 at 2100 UTC. RFA is a private, nonprofit corporation broadcasting news and information to listeners in Asian countries where full, accurate, and timely news reports are unavailable. Acting as a substitute for indigenous free media, RFA concentrates coverage on events occurring in and/or affecting Burma, Cambodia, Laos, North Korea, the People’s Republic of China, and Vietnam. This latest design shows a standard RFA microphone flag used by many of our field reporters; this one rests on a surface in our Vietnamese audio studio in Washington DC. This is RFA’s 68th QSL design and is used to confirm all valid RFA reception reports from September – December 2018.